As part of my ongong pledge to Wardrobe Refashion, and as proof that I’ve been watching paying attention to “What Not to Wear” I’ve been on a Refashioning Frenzy through my closet. Doing what, you wonder? Whacking off all of the ankle length skirts to a more flattering length. Long skirts were “the thing” about a decade ago, but honestly, did I really think they were suitable for my vertically challenged self when I purchased them? Huh? I mean, where was Stacy London when I needed her? 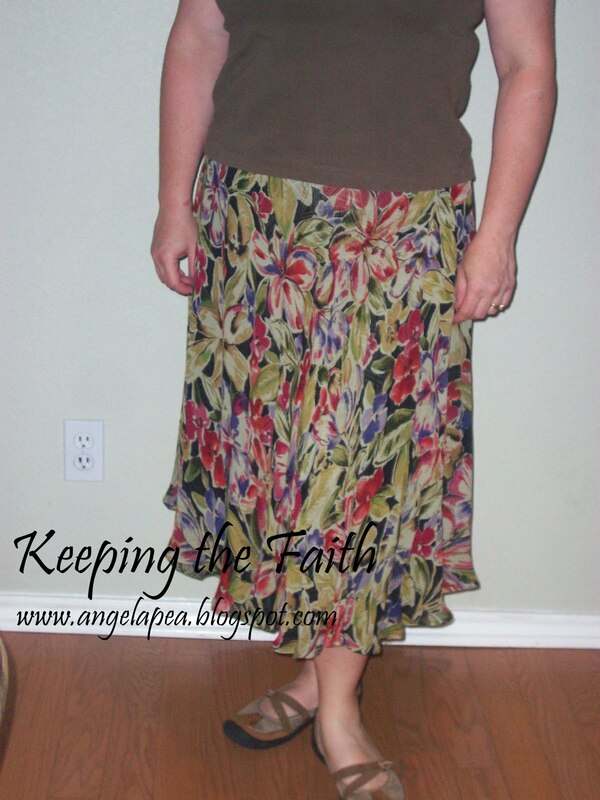 This skirt is a favorite, and I’ve had it for eons. Really. It was a post pregnancy purchase after 16 year old Teen Daughter #2 was born. The fabric is a luscious, heavy silk blend, in a season spanning black/gold/ivory print. It used to drop all the way to my ankle; that is, until I whacked 14″ off the hem. This skirt was a huge challenge. It is bias cut silk georgette, double layered with two different patterns so that the skirt is reversable. (The inside layer is a black and olive geometric print.) This skirt used to drag on the floor and I had to wear it with really tall heels. Again, WHAT was I thinking when I purchased it? Also, since it dates back to before Teen Son#1 was born, I really needed to generate a little more room at the waistline. I wanted to leave some length to the skirt to keep the flowing, twirly effect, so I started by rolling the the flowing, twirly effect, so I started by rolling the skirt at the waistband to remove some length. However, that left me with a short skirt so wide that it resembled a square dancing getup. I ended up removing fabric from both the top and the bottom to maintain a reasonable width at the hem and still allow for breathing room at the waist. I restitched the casing, and inserted a longer elastic. I tried several times to get a narrow hem along that bias edge with the machine, but I just couldn’t get the bias even with both layers of the skirt. I ended up stitching a hankie hem by hand with the skirt on a hangar, tweaking up and down as I went around. I won’t bore you with more pictures – there are three other skirts that went from ankle length to knee length: a black knit straight skirt, a leopard print silk A-line, and a brown tweed pencil skirt (okay, lets’ admit it….ankle length pencil skirts, even with thigh high splits, are totally impractical to wear). The brown tweed was part of a suit that has a paisley print duster length jacket. I’m tackling the coat next, as it is now longer than the skirt!